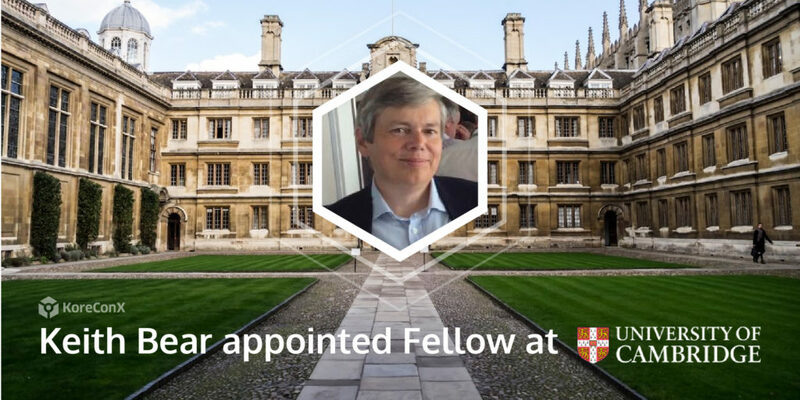 [New York, NY – April 09, 2019] – KoreConX is pleased to announce that Keith Bear, one of their company advisors, is now a Fellow at the Cambridge Centre for Alternative Finance (CCAF), part of the Judge Business School at Cambridge University. Mr. Bear has accumulated over 35 years of expertise during his career focused on financial markets, business strategy and blockchain, which will serve him well in his new role. For over 20 years, Mr. Bear was known as the face of the Financial Markets industry at IBM. Responsible for the global strategy, development, and execution of the company’s business in the field. He worked with global clients on major transformation programs, including blockchain deployment with Exchanges, trade finance organizations, and banks. His work at Cambridge University will be focused primarily on blockchain, fintech, and alternative finance. “We are very grateful to have Mr. Bear on our Advisory Board, he has been instrumental in our goal to Revolutionize the private capital markets. Being appointed a Fellow in one of the most prestigious universities in the world only confirms once again the quality of our advisors, not only guiding us in our business strategy and approach but also directing the industry as a whole, educating and removing friction for innovation in the FinTech and alternative finance worlds,” said Oscar Jofre, Co-Founder and CEO at KoreConX. “My new role at Cambridge University’s Centre for Alternative Finance is focused on adoption and innovation around blockchain technologies and business models. I look forward to continuing my advisory role at KoreConX to help Oscar and team continue to develop the business, building on the insight that CCAF’s independent publicly-available research will deliver,” said Mr. Bear.